There is no doubt if I may ask some more ISP’s And IT experts, that MikroTik is an excellent router for managing ISP or local ISP Bandwidth. This is one of the reasons, most of the ISPs are now using MikroTik router for managing their client bandwidth. There are various types of queue services in MikroTik router for managing internet bandwidth. Among them is PCQ. PCQ can specially be used for maintaining ISP or local ISP bandwidth. For such reason, in this article I will show how to maintain ISP or local ISP Bandwidth with MikroTik PCQ service. 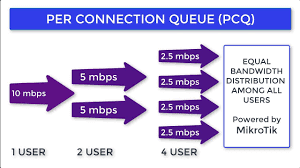 PCQ simply means Per Connection Queues. This service helps to maintain ISP or local ISP Bandwidth so easily. As a network administrator of any ISP company, you are in position to manage various offered bandwidth packages like 512kbps connection, 1Mbps connection or 2Mbps connection for most of your clients out there. You will agree with me that Managing these packages with MikroTik Simple Queues will be so hardy and time killing. So then we think of a simple way of managing these queues.. and then we have the PCQ concept. Mikrotik PCQ feature will be so helpful for managing these bandwidth packages because in PCQ service you will just create different PCQ profile according to your bandwidth packages and assign any PCQ profile to a network block. Then, every IP of this block will get equal bandwidth that you assigned in PCQ Profile. So, your MikroTik Queue configuration is just one time. You will map network block according to your offered bandwidth packages and then assign client IP according to their purchase bandwidth. PCQ is a simple but effective and hassle free method for managing your ISP bandwidth. Say, you have three offered packages for your ISP clients. These are 512kbps connection, 1Mbps connection and 2Mbps connection. So, your proposed plan would be like below. 512kbps clients will get 192.168.10.0/24 block IP. 2Mbps clients will get 192.168.12.0/24 block IP. Now if a client purchases 512kbps connection, you will just assign him/her a 192.168.10.0/24 block IP or if a client purchases 1Mbps connection, you will assign him/her a 192.168.11.0/24 block IP. If you configure PCQ in your MikroTik router properly, every client of these blocks will get your assigned bandwidth because in PCQ service every client gets equal bandwidth that will be assigned for the whole block. Complete PCQ configuration with MikroTik router can be divided into two steps. After completing MikroTik router basic configuration, we will now configure MikroTik PCQ service for managing client bandwidth. MikroTik PCQ configuration can be divided into two steps. First we will configure/create Queue Types for our offered packages. Here we will define Upload and Download speed for our offered packages. So, follow my below steps to complete Queue Types configuration. Login to your MikroTik Router and click on Queues menu. Now click on Queue Type tab and then click on PLUS SIGN (+) to add new Queue type. New Queue Type window will appear. In this window, type 512kbps_Download or as you like in Type Name input box and select pcq from the Kind drop-down menu. This pcq will decide to assign rated bandwidth for all the clients who have this queue type. Now type 512k in Rate input box and check the Dst. Address checkbox from the Classifier panel and then Click Apply and then OK button. Again click on PLUS SIGN (+) and type 512kbps _Upload in Type Name input box. Choose pcq from the Kind drop-down menu and type 512k in Rate input box and then check Src. Address from the Classifier panel and then click Apply and OK button. Do step 2 and step 3 for 1Mbps connection and 2Mbps connection. Just change the Rate value 1M and 2M accordingly for these connections. PCQ Queue types configuration has been completed. Now we will configure Simple Queue for these PCQ Queue types. After creating PCQ Queue Types, we will now declare different IP blocks that will get these PCQ Queue types. Follow my below steps to complete Simple Queue configuration for the PCQ Queue Types those you created before. Click on Simple Queues tab and click PLUS SIGN (+) to add new simple queue. New Simple Queue window will appear now. In General tab, type 512kbps_Clients in Name input box or any text that you like and type 192.168.10.0/24 in Target input box. You can also define multiple IP blocks by clicking Add new value button located at right side of Target input box and typing new IP block. Click on Advanced tab and choose 512kbps_Upload and 512kbps_Download from Queue Type drop-down menu. As you have assigned 512kbps Upload and Download for Queue Type of this simple queue, all the IPs in this IP block will get 512kbps speed separately. Now click Apply and then OK button. Do step 1 and 2 for 1Mbps connection and 2Mbps connection. Just change Target address and Queue Type for these connections. Bandwidth Management Using Mac Address.